You might have heard that my course has suffered some winter kill and I'm sure some of you have some questions about why this happened relating to GP and the MLSN as well as how I plan on recovering from it using the GP and MLSN. So is my dead grass a result of the MLSN or GP? 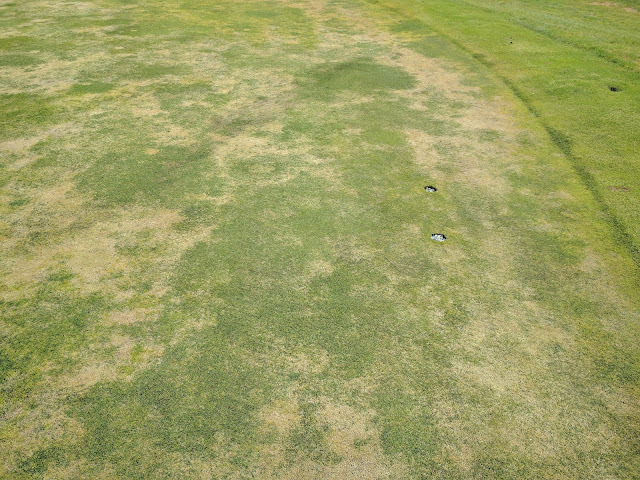 If I was the only course to have winter damage I might think so. Even so, I do talk about some pretty extreme practices that could lead to winter death of my grass. I have talked about how I limit potassium going into winter as inspired by this research. While this is interesting stuff and something that I am trying, Doug and others have made it clear that by limiting potassium during the fall can decrease the winter hardiness of poa annua. Poa annua is the predominant grass species on my putting greens so obviously it would be a bad idea to limit K during the fall as this would lead to bad things happening. Low K hasn't hurt the poa on this sunny green. Last fungicide was late September and it's still virtually clean after 6 weeks of snow cover. 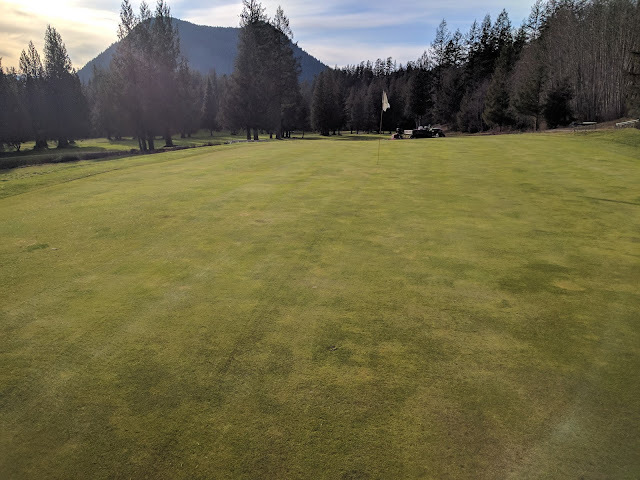 So while I have been playing around with limiting my potassium in the fall, it is only on greens that have a mixed stand of bentgrass and poa, and on greens that typically never see damage in the winter months. The greens that have a history of damage, received potassium fertilizer with every application last fall in order to hopefully reduce the chances of winter death. Even with this supplemental potassium fertilizer last fall, the greens died. As we all know, sometimes no matter what we do, mother nature wins and our grass loses. 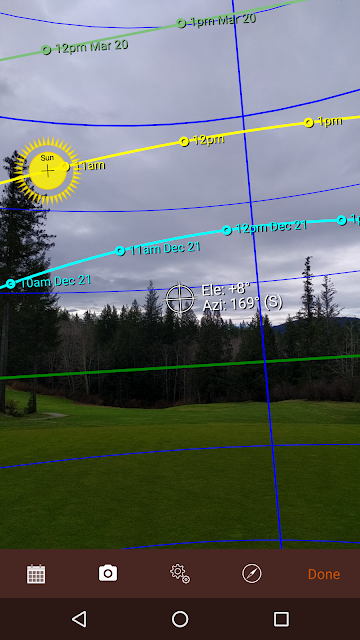 As described in my post to my membership, the real issue on the damaged greens is shade. 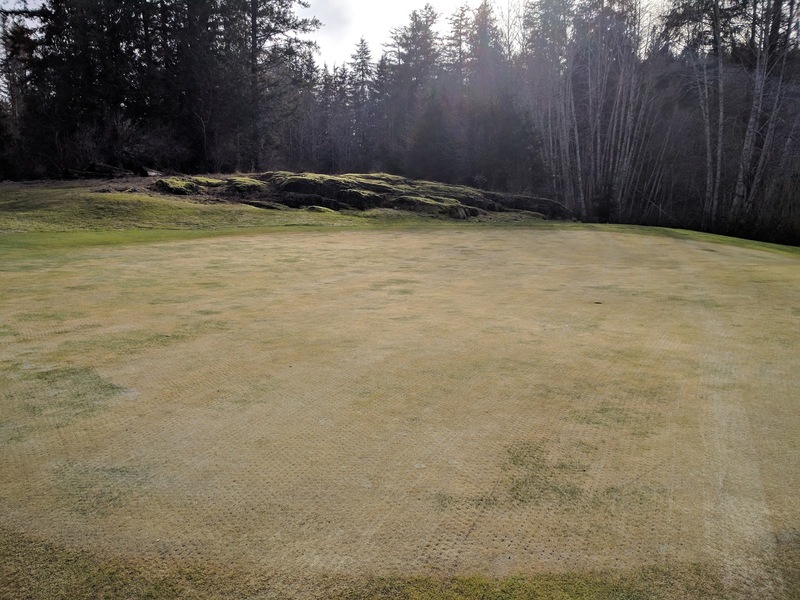 Greens that receive adequate sun have no problems even though they endured the same freeze thaw and ice events as the other greens. The shade also makes the ice issues worse on the already weakened grass. While there is no way for me to determine if the damage was made worse by the way I fertilize my grass, I highly doubt it as the grass that receives enough sunlight is in the best condition I have ever seen it despite not receiving fall potassium. Adequate sun, good grass, and no potassium in the fall. 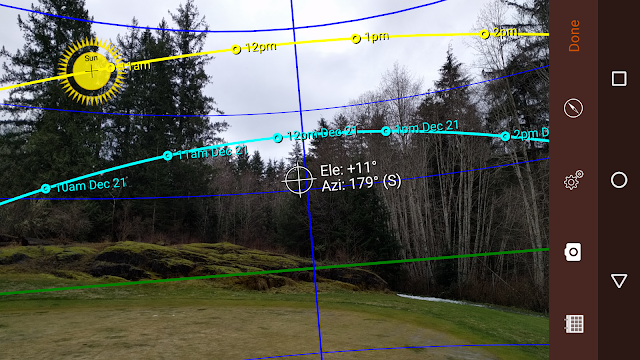 So no, I don't think the MLSN or GP had anything to do with my winter damage on my course. There are other courses in the area that fertilize differently and they also saw damage on their greens, again, in shaded areas. So what about recovery? Well this isn't the first time I will have to recover my greens while using the GP and MLSN. The first winter after I adopted the MLSN and GP my greens also suffered similar hardships. At this time I was seriously questioning the MLSN and GP but decided that the science still made sense to me and that I would stick with it. In the end, the greens recovered nicely and I continued to use the MLSN and GP to fertilize my grass. So what did I do the last time and what am I going to do this time? One of the great things about social media and the internet is the ability to share what works and what doesn't work. I know what I did last time and it worked and I have talked with many others about what they have tried for recovery in the spring. One thing that particularly stuck with me was a conversation with Bill Kreuser about his research done on methods to accelerate winter recovery. Basically, no matter what they tried, be it increased fertilizer or various covers, "it becomes increasingly apparent that timing of spring seeding and air temperatures following seeding are fundamental factors affecting the success of re-establishing putting greens." While this is only one study, I would agree based on my previous experience recovering from winter damage. The last time I had winter damage I used the growth potential as a guide, but increased rates to hopefully get increased recovery. I more or less applied double the fertilizer that the growth potential recommended. For the first 4 months of 2013, that amounted to just over 1g nitrogen/m2 (~0.25#/1000). This was still well below the rates that I used to apply nitrogen during that time of the year. I had some good growth rate data and knew when I could expect the grass to grow. I also knew that pushing growth when it was cold was a waste of time and would only cause issues when it finally warmed up. 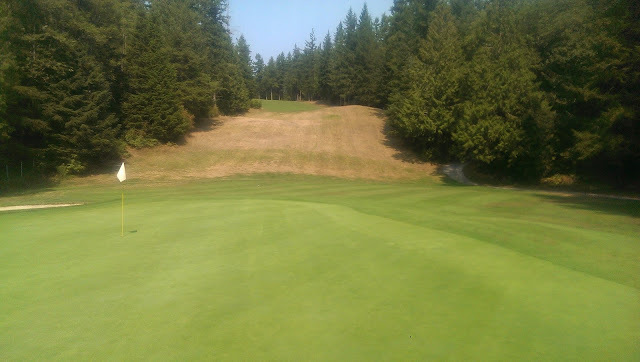 I was patient and by May 1st the greens were back in good condition. I don't have the luxury of soil testing often or in many spots each year due to cost so I took what I knew and used to ensure that my grass had the nutrients that it needed. I decided to play it safe as I couldn't do a test at that time and applied the fertilizer in a ratio that was found in the plan. This would result in some minor over application of some nutrients that I already had in my soil, but when I finally did do a soil test in June, I would be able to adjust and make up the savings at that time. That's the thing about MLSN. It is simple and allows me to make some assumptions to get me through periods of unknowns until I can again do a soil test. I applied slightly higher amounts of K and P and Ca than I would normally apply, but at the end of the year I was right back on track with applying only what the plant could use. This year I don't plan on doing anything different. I applied a light application of a granular slow release fertilizer blend that I had lying around (first granular fertilizer on greens since 2013), and will continue my regular fertilizer program of liquid fertilizer applications that are light and frequent. I will again soil test this Spring and will make adjustments to my nutrient quantities at that time to limit any waste. I have also decided to use this opportunity to get some more bentgrass established on my greens. The last time we had winter damage I threw down some bentgrass seed and it filled in nicely. Those areas today are still damaged, but playable as there is enough bentgrass to fill in the voids left by the dead poa. I am also doing tests to see if I can use winter play on frosty greens to selectively kill poa annua from my greens with bentgrass. Stay tuned for the results of that!